This review ran in the Sept. 23 edition of The Hamilton Spectator. We should start lobbying now to make Hamilton a pit stop on the next season of Amazing Race Canada. Teams could touch down at Hamilton International Airport during Supercrawl, bike down the Mountain to James Street North and then choose between one of two tasks – Sign Up or Move Out. In Sign Up, each team would need to collect 10 pages worth of signatures in support of a downtown casino. In Move Out, each team would have to search through the crowd of 100,000 people to somehow find a millennial hipster who dreams of moving to the ‘burbs and driving an SUV two hours every day to and from work. Leigh Gallagher would likely recommend the first task. According to Gallagher, the only thing millennials like less than suburbs are cars. “Millennials may be the first generation of young people since the automobile was invented to be indifferent about cars and driving.” That’s a big problem for suburbs where the only way to get around and out of the cul de sacs is to get behind the wheel. 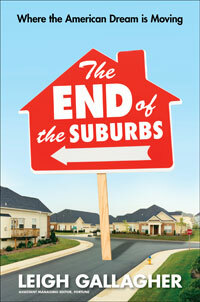 Millennial attitudes are just one of the forces at play and working against the suburban dream. Poverty rates are rising fast in the ‘burbs. “Americans started moving to the suburbs because they considered them safe, happy enclaves where they could escape the crime and poverty of cities. But this has become an increasingly false characterization.” South of the border, the growth rate in the number of poor living in the suburbs was more than twice that of cities. And the suburbs are now home to the largest and fastest-growing poor population in the country. Rising prices at the pumps punish suburbanites who are doing Thelma and Louise-length commutes. Gallagher says many families are now spending nearly half their paycheques to pay their mortgages and gas up their vehicles. “Economists say the cost of distance is starting to get baked into housing prices, sending valuations down in remote communities.” The days of driving until you qualify for a mortgage are numbered. Big box chains are scaling back and setting up shop in cities. Walmart is opening smaller Neighbourhood Market stores while Target rolls out urban stores called City. We’re eco-obsessed and conspicuous consumption is out. A McMansion with a fleet of luxury SUVs in the driveway isn’t quite the status symbol it once was. And municipalities are starting to realize the ‘burbs are financially unsustainable. Low-density housing doesn’t generate enough tax revenues to pay for infrastructure, much less maintain and repair it. And bills are starting to come due. Some suburbs will weather the storm, particularly older ‘burbs close to cities. The hot development trend is to make these suburbs more urban. Downtowns are being revitalized. Streets are adopting a mix of residential, commercial and retail uses. Houses are shrinking, moving closer to sidewalks while back decks and patios are being replaced with deep front porches. Residents are able to walk more and drive a little less. The key takeaway for Hamilton? Don’t expect the white hot housing market in lower city neighbourhoods to cool off. If anything, count on more neighbourhoods seeing an influx of money, redevelopment, millennials and young families. And someday, the code red neighborhoods in downtown Hamilton may well move out to the edge of town. This review first ran in the Sept. 11 edition of The Hamilton Spectator. Move the children’s museum into the heart of downtown Hamilton and supersize it. Give kids a place to call their own that rivals the best and biggest in North America. Make Hamilton home to the Canuck version of the National Museum of Play in Rochester or the children’s museum in Indianapolis. Build the museum with corporate goodwill and taxpayer dollars. Sustain it with patrons, members and foundations. And run it as a nonprofit with community leaders on the board. Create a one-of-a-kind space that amazes and inspires children to explore, discover, imagine and create. Offer up a technology showcase, a celebration of the arts and a learning lab for students, educators and researchers. Become a destination for hundreds of thousands of families from near and far who stay the weekend and spend money in our hotels, restaurants and shops. Make it a hotspot for birthday parties, field trips, outreach programs, summer camps and special events for the young and young at heart. And use the museum as living proof that Hamilton’s truly the best place to raise a child. For inspiration, check out Sir Ken Robinson’s TED Talk. Or watch his video clip again if you’re among the folks who’ve already seen it nearly 18 million times. Robinson’s big ideas – that we must stop educating creativity out of our kids and that the arts matter as much as math and science – will strike a chord and plant a seed. Robinson fits author John Butman’s definition of an idea entrepreneur – someone who’s passionate about a big idea and highly skilled and savvy at spreading the gospel. Big ideas are everywhere. From tweets to TED Talks, blogs, best sellers and conferences, there’s never been more ways to get the word out to more people. And therein lies a big problem. The supply of ideas has outpaced demand, says Butman. What’s more, it’s not enough to have a big idea. It takes real skill to humanize and animate an idea for mass consumption. “It’s difficult to develop an idea and harder to express it well,” says Butman, who helps build idea platforms for leaders from the private, public and nonprofit sectors. 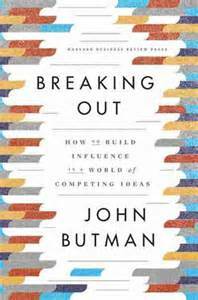 Butman’s mapped out a process for how idea entrepreneurs go public, break out and achieve influence. You must express your idea in the fullest, most powerful and compelling way possible, says Butman. That expression can come through books, blogs, op-eds, lecture circuits and myriad other ways to connect with an audience. “Going public is the time when you decide to make a serious, deliberate move to take the idea to a new level. Rather than think about it as an interest or a sideline, the furtherance of the idea will become your primary effort – all other activities will be secondary.” Butman says this focus is why so many idea entrepreneurs are quick to thank and give credit to their patient and forgiving families. Butman shows how to break out your ideas and build influence by retracing the steps of idea entrepreneurs like French lifestyle guru Mireille Guiliano, TOMS founder Blake Mycoskie, dog psychologist Cesar Millan and teenager Hannah Salwen who dreamed up with the Power of Half project.